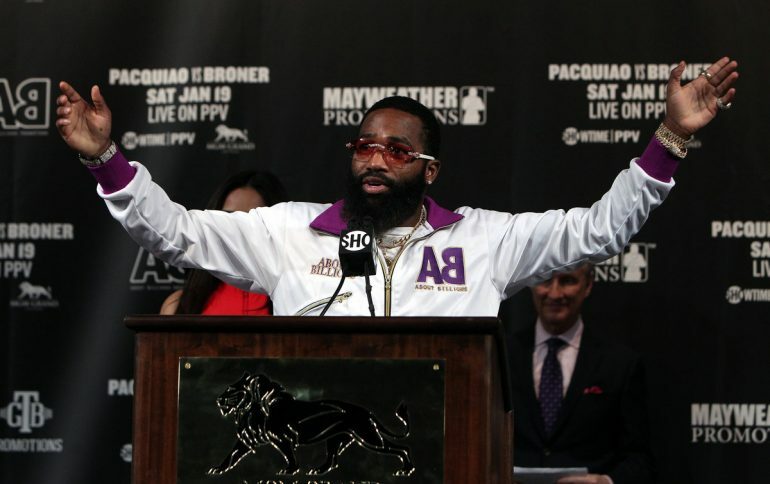 LAS VEGAS — Adrien Broner is more focused than ever before, Mayweather Promotions CEO Leonard Ellerbe claims. Broner’s trainer, respected coach Kevin Cunningham, guarantees Broner will perform spectacularly Saturday and score the upset over Manny Pacquiao. Broner himself swears he’s more focused than ever; that this time, it’s different. We’ve heard this story before, not just with Broner, but with other talented fighters before him who underachieved. Former two-division champion Zab Judah comes to mind. Broner insists he’s laser-focused on the task at hand. That he’s never had better preparation ahead of a marquee fight than he enjoyed for this training camp in West Palm Beach, Florida. It’s hard to believe Broner. After all, this song and dance isn’t new. He claimed he would let his hands go against Shawn Porter; he didn’t. He told anyone who would listen that he would take the fight to Mikey Garcia; he refused to throw many punches and was totally outclassed. But sure, this time, against the legendary Manny Pacquiao on Saturday (Showtime PPV, 9 p.m. ET), he’ll put it all together. He’s a new man, everyone around Broner says. It’s harder to believe them than ever following his behavior at Wednesday’s news conference at the David Copperfield Theater at MGM Grand. Seems like the same ol’, disrespectful Broner more intent on creating headlines and acting the fool than anything else. If this is the focus he shows just three days out from the biggest night of his career, why should we believe that he really has changed? Broner must prove he has a different mentality. And since it’s too late to display that outside of the ring, he’ll have to do so Saturday against Pacquiao. Broner (33-3-1, 24 knockouts) is still missing a signature victory, despite the name recognition he possesses. His three most high-profile fights came against Marcos Maidana, Porter and Garcia. Maidana scored two knockdowns of Broner and won a decision, though he rallied late. Porter out-hustled Broner over 11 rounds before The Problem dropped his foe in Round 12. Still, Broner dropped a lopsided decision. Broner received a shot against Garcia in the summer of 2017; the fight wasn’t remotely competitive. Broner continues to receive lucrative opportunities in spite of limited success. Really, it’s his antics that garner those fights for him. He always generates favorable ratings. He’s one of the few boxers that many casual fans are familiar with, even if it’s mostly due to his exploits outside the ring. If Broner is going to finally win the big one — and make no mistake, even at age 40, Pacquiao remains a formidable threat — he’ll have to do something he’s unaccustomed to: lead. Broner can’t wait for counter opportunities against a fighter like Pacquiao. The future hall of famer won’t stop coming; won’t stop throwing. Broner will have to punch with Pacquiao, rather than sit back in the pocket. “It ain’t about getting off to a quicker start; it’s just about getting off at the right time,” Broner said. “I ain’t letting him put sh– in the bank. … I’ve been in the middle of the big fights so it’s not overwhelming; it’s normal to me. His talent has never been in question. The 29-year-old possesses quick hands, even if he is flat-footed. He’s an impressive counter puncher. And when he’s hurt, Broner has shown immense guts. He’s won titles in four weight classes, but he’s still searching for that elusive victory that will forever shed that underachiever label. “I just have to go out and win this fight, then everything is going to start going my way,” Broner said. “Saturday night, I will be victorious. This is a defining moment in my career and it’s going to be one of the biggest nights of my life. We’ve heard this sort of talk before. Sooner or later, Broner needs to deliver.